Sister ship to the Superspeed 1, Superspeed 2 started operating for Color Line in June 2008 decreasing crossing times for passengers to and from Norway. The Vessel has a capacity of 1929 passengers, 71 crew members and over 2,000 metres of lane space in its garages for vehicles to be stored. There are a various amenities onboard such as three restaurants, café, bar, duty free shops and much more to keep you entertained through your journey. There are no cabins onboard this vessel however there are two different classes of seating to choose from. There are 93 Business Class lounge seats available and 261 in the Voyage Class lounge. A screen is with free TV and internet access fitted to the back of each chair. Choose from a variety of places to eat and drink onboard during your crossing with menus to suit all tastes and ages. Catch Me If You Can restaurant offers Nordic Cuisine and a childrens buffet, Fly Me To The Moon restaurant here passengers can find baked goods, salads, vegetarian dishes, pizzas, cakes and much more. For something more relaxed Bluefins lounge and bar is located on deck 7 and 8. The duty free shop, including Color shop and the Deli shop is located on deck seven. At Color shop, passengers can find children's clothing, jewellery, watches, music, films, cameras and other electronic products. Duty free shop also sells products at tax free prices such as wine, liquor, beer and chocolate. A varied range of meat products and delicacies are sold at Deli shop. Please Note: Whilst we have taken great care in making our Superspeed 2 guide as accurate as possible, onboard facilities, services and entertainment may vary depending on the date and time of year that you travel, facilities mentioned may change without notification and ferry companies reserve the right to operate vessels other than those mentioned at time of booking without prior notification. 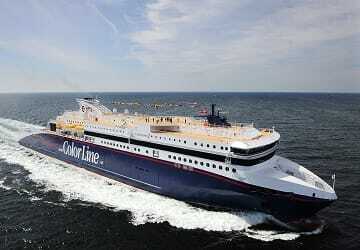 Had a great trip with Color Line from Hirtshals to Larvik. We had prepared ourselves with our son for nearly four hours of 'entertainment' and brought DVDs, games and books. However, to our surprise, there was a small climb/play equipment on board and a large screen with movies. We could keep an eye on him while he was playing and were able to relax and read with a cup of nice coffee.